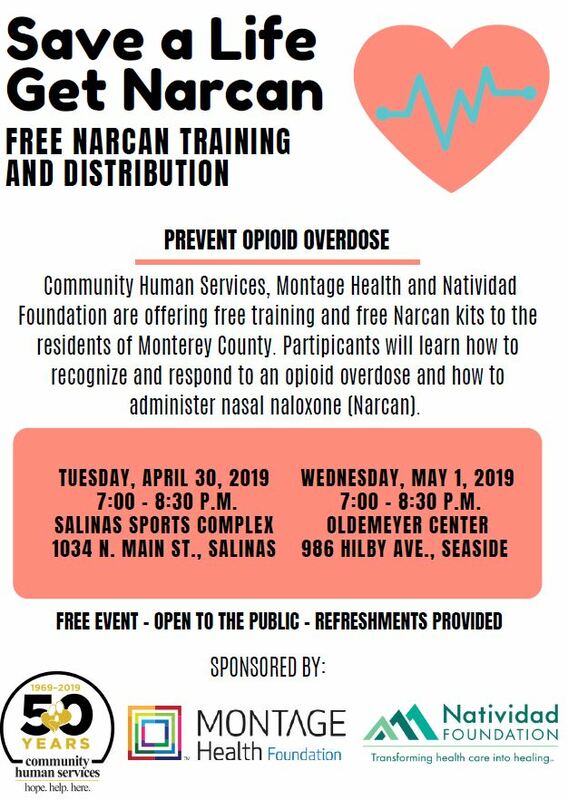 In response to the local opioid epidemic, Community Human Services (CHS), Montage Health Foundation and Natividad Foundation have partnered to offer free trainings and free naloxone (Narcan) to the residents of Monterey County. Naloxone can save someone’s life by counteracting the life-threatening effects of an opioid overdose. The trainings will be held from 7-8:30 p.m. on Tuesday, April 30th at the Salinas Sports Complex, located at 1034 N. Main Street in Salinas, and 7-8:30 p.m. on Wednesday, May 1st at Oldemeyer Center, located at 986 Hilby Avenue in Seaside. Attendees will learn how to recognize the signs of an opioid overdose and administer the aerosol version of Narcan to reverse a potentially deadly overdose. Attendees will also receive a 2-pack of Narcan nasal spray. There will be a panel discussion of experts in the field, including CHS’s Medical Director and physicians from Montage Health and Natividad Medical Center. CHS will also have representatives on hand to provide information and answer questions about local treatment options for those struggling with substance use disorder. Both events are free and open to the public. Refreshments will be provided. More information can be found at www.chservices.org or by calling 831.658.3811.